I’m not here to argue with you that docker-compose is the best for all scenarios. Definitely there are some, which we can not or should not dockerize. Well, I still insist that it’s capable for most cases. CM is good, but docker/docker-compose is just better for env setup. (Read: 5 Common Failures Of Package Installation). Not convinced, my friends? Give it a try and challenge me now! With plain docker facility, we can setup envs like below. But… The command is just too long, isn’t it? What if you need to start multiple different containers? You may easily mess it up, right? Show time for docker-compose, an advanced version of docker run. 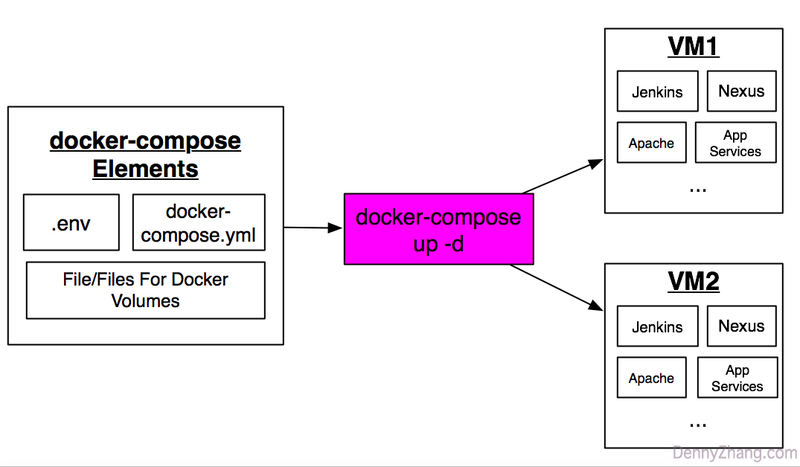 Just one single command, docker-compose up -d! We can run the same deployment process against another new environment within just a few seconds. Beautiful, isn’t it? Here are my lessons learned using docker-compose. Host all necessary things in git repo: docker-compose.yml, .env and docker volume files. Everything you need can be and should be found in git repo. People can easily review and comment your changes via PRs. You can audit the change history, and understand issues. 1.2 2. [Port Mapping] Default docker port mapping is dangerous for public cloud. You may get surprised how insecure docker port mapping feature is! Let me show you. Image you have a mysql instance running with below docker-compose.yml. With default setting, anyone from the internet can access your db, port 3306. Why? docker add iptables rules widely open FOR YOU. (Sweet, isn’t it?) Anywhere can access. So let’s limit the source ip for the access. Good idea! Unfortunately, it’s impossible. That rule is added by docker. To make it worse, it provides no hook points for us to change this behavior. With some more thinking, you may think: how about I delete the rules created by docker, and add a new rule? I’m an iptable expert, it’s easy. Well, it’s not easy. The tricky part is your customized iptable rules won’t be recognized and managed by docker. It would easily mess up, when service/machine reboot. Especially when we restart container, the ip will change. So instead of default port mapping, I only bound the port mapping to specific ip address like below. Make sure containers doesn’t hold any unrecoverable application data. Consequently we can safely recreate docker envs, or even migrate to another environment completely and easily. It’s always a good idea to run migration rehearsal. Very few manual steps, mostly it’s about credentials. All critical data would be in volumes only. To backup the system, we just need to backup the folders of data volumes. Enforce periodical folder backup for data volumes, like weekly backup. To reduce out-of-disk issues, remember to rotate very old backupset. (Read: Reduce Support Effort Of Low Free Disk Issues). To avoid local VM failures, backup to a remote VMs or AWS S3. During deployment, any request to external services is a failure point. To make sure the deployment is more smoothly, I always build my own docker images pre-download packages/files, if necessary. Monitoring and alerting are good. External monitoring is easy and useful. Try uptimerobot.com. It an run url check/port check every 5 minutes. If the check has failed, we can easily get slack or email notifications. Didn’t I mentioned, uptimerobot.com is totally free? I’m happy to be a loytal customers for more than 5 years. For a complicated docker-compose env, some services may fail to start. But debugging the issues, it’s better we have the containers up and running. I find it useful to replace the containers’ start logic with some dummy place holder.